Chariots of Fire top price seats available for under £50! Liddell and Abrahams weren't just ordinary athletes - the first was a devout Scottish Christian who runs for God and the second was an English Jew who has to overcome some pretty grim facets of human nature, including prejudices far beyond reason. In fact Liddell was so enraptured with his religious beliefs, he flatly refused to run one Olympic 1924 event because it fell on a Sunday, not a good day to be observing the Sabbath AND hoping to notch up a medal. 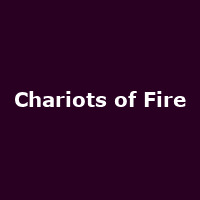 The Gielgud Theatre in London's West End will be hosting an extensive five-month run of a new adaptation of Chariots of Fire, which will include the original storyline and the impressive Vangelis themes and soundtracks. This is truly an Olympic tale that is sure to entice theatre-goers and sports fans alike. With the iconic play set to open on 22nd June, we can offer you the chance to save money on Top Price seats! The Special Offer is: Book Top Price Seats for £49.99 instead of £55. The offer is very limited and valid for all performances from 22nd June to 31st July. Excludes Saturday evenings and 3rd July. To take advantage of these savings, click on the Book this offer button below. You are advised to book now as demand for this show will be very high during this Olympic year!